Holy cow! 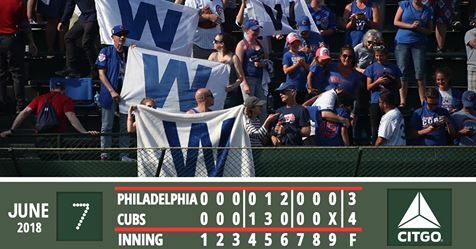 The Cubs held on to beat the Phillies 4-3 at Wrigley on Thursday, taking 2 out of 3 in the series and moving just a half-game back of Milwaukee for the NL Central lead. Anthony Rizzo's tenth home run of the season set the pace for the North Siders, as he raised his season average to .253 -- up from .154 on May 1. The top of the order continued to produce for Chicago, as Albert Almora led off and went 2-for-4 to raise his average to .314 while Tommy LaStella batted second and went 1-for-2 to raise his average to .329. The Cubs bullpen continued its dominance, throwing 4.1 innings of two-hit, one-run ball to pick up Tyler Chatwood, who lowered his season ERA to 3.86 by allowing only one earned run in 4.2 innings despite allowing seven walks. 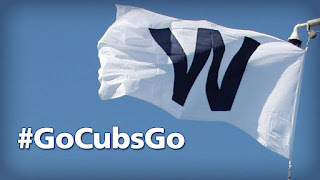 The Pirates head to the Friendly Confines Friday to kick off a weekend series before the men in blue head north to Miller Park to face the Brewers next week.